Even though I complain about the heat all throughout the year I love Summer. There's something in the air which makes me happy at this time of the year. I was born in the peak of summer so I guess I'm a summer girl at heart. Summer calls for strappy tops so I am constantly on the lookout for an effective sunscreen as I drive a long distance in the harsh afternoon sun almost daily. You obviously know that sunscreen is extremely necessary in one's skincare regime, not only to prevents sunburn but also to avoid premature ageing and skin cancers. And in a hot and sunny country like India, one must use a sunscreen with the highest SPF (SPF50+) for effective protection. I discovered Avène thanks to a sample I got in My Envy Box and was very happy with their products. For those of you who don't know, Avène is an acclaimed French skincare brand that has been globally recognized and recommended by dermatologists for its range of products for sensitive skin. They've recently launched in India and have a sun care range that offers Very High protection for sensitive skin. The product I've been using is the Eau Thermale Avène Very High Protection Emulsion SPF 50 which provides broad-spectrum protection from UVA & UVB rays. Its water resistant, non-greasy, lightweight and gives a matte finish and is very safe for sensitive skin. It's patented formula contains a powerful and photostable anti-oxidant called Pre-Tocopheryl, which binds the free radicals created by oxidation of the skin and stops them from causing damage to the body’s cells, thus preventing the effects of ageing. It also slows melanin production. It also contains the acclaimed beauty blogger favorite Avène Thermal Spring Water which is known for its soothing and anti-irritant properties. In fact, Avène Thermal Spring Water is the basis for their entire skincare range, as it has a special composition which makes it effective at soothing sensitive skin, especially during and after sun exposure. It comes in a squeezable tube that has a pump dispenser covered by a plastic cap which makes it travel friendly, hygienic and ensures that no product is wasted. This product is truly an emulsion - a white liquid with a consistency which is between that of a cream and a lotion; neither too thick, nor too runny. It spreads easily on skin and two pumps are enough for the face and neck. After proper blending, it sinks into the skin completely, without leaving any whitish or ashy cast on the face. Its moisturizing yet non-sticky and gives skin a mattifying effect so it looks natural and nourished. Avène is available in India at leading chemist stores in Mumbai, Delhi, Bangalore, Hyderabad, Chennai, Ahmedabad, Chandigarh, Ghaziabad, Gurgaon, Noida and Thane. 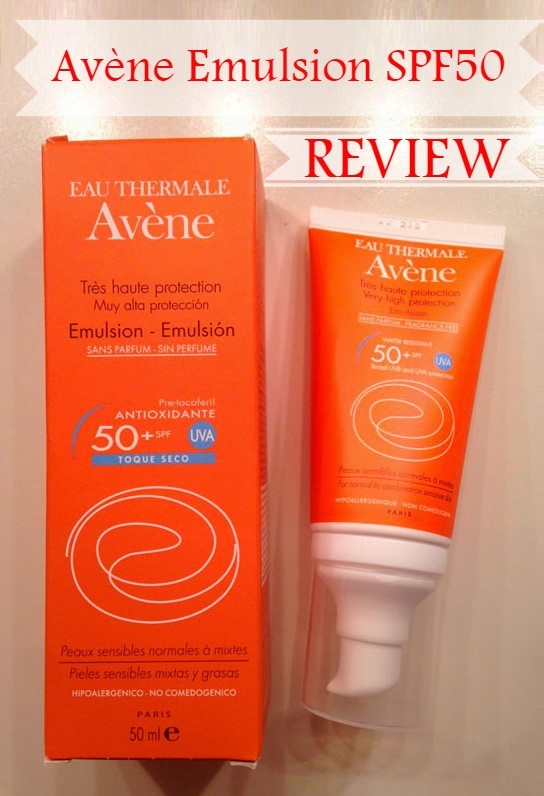 Have you used this or any other product by Avène? How did you like them? Never heard of this brand before..looks great! This sounds great. And it is wonderful that it is travel friendly as well. I love these products, I use only Avene!!! Lightweight and matte? Sounds like a dream come true. I will see if I can get a sample somewhere. very nice review !thanks for sharing! This product looks incredible! I want to try it out! Nice review, it looks great! Can't say that I have used it before but I've seen a few reviews about the brand in general and everyone always has wonderful things to say. Never heard of this brand but it sounds incredible. great review dear!!! cool post. I have read amazing reviews about this product so it's great to read another good one from you. Will pick this up to try for summer. I really like Avene products as they're good for sensitive skin. This sunscreen sounds lovely and the fact that it has an SPF of 50 makes it even more attractive to me. Thanks for the review June! Awesome tips! we want to try it! i have not tried these before so thanks for sharing! This looks so luxe, I'll definitely have to try it out! Great post! I have been wanting to try their products for some time now! You answered my questions! I'm a summer girl at heart, too! This product loves fab. I love a high SPF! I love that it offers high protection for sensitive skin. Nice review. Wonderful review! It sounds like a great sunscreen. How are you doing? Long time...You in Pune only? Gotta protect your beautiful skin! Thanks for sharing. I will bear this brand in mind for when I go travelling to sunny places later this year! I really need to try and SPF50, have wanted to for ages. Summer has just finished where I am, so sad. I have used Avene products and I must say they are very good! I'd love to try this one too!